We just finished our first ever Mother’s Day Sale! While we didn’t fulfill thousands of orders, it was never our intention to do so. We had a small batch of Mother’s Day gift orders and it was a wonderful experience. Thanks to all our customers! I’ve had some thoughts I’m not sure I can entirely put into words today, but the call I got from my own mom yesterday got me to thinking about the importance of what we do and make here at Design Bindery LLC. Just exactly what’s so special about our handmade books, when you can go to Walmart, Target or other places and get cheap paper to write on? What’s the difference? Premium Grade 70 lb Rolland Recycled Natural writing paper with 50% PCW. Our paper is acid free and environmentally firendly. All other materials used in our products are carefully sourced with special consideration to environmental aspects and consistency of our product. Our design and styles run from classic to trend forward and are typically minimalistic in design with a focus on functionality. You won’t find our journals to be adorned with beads, lockets, and other cluttery objects that are mass produced. 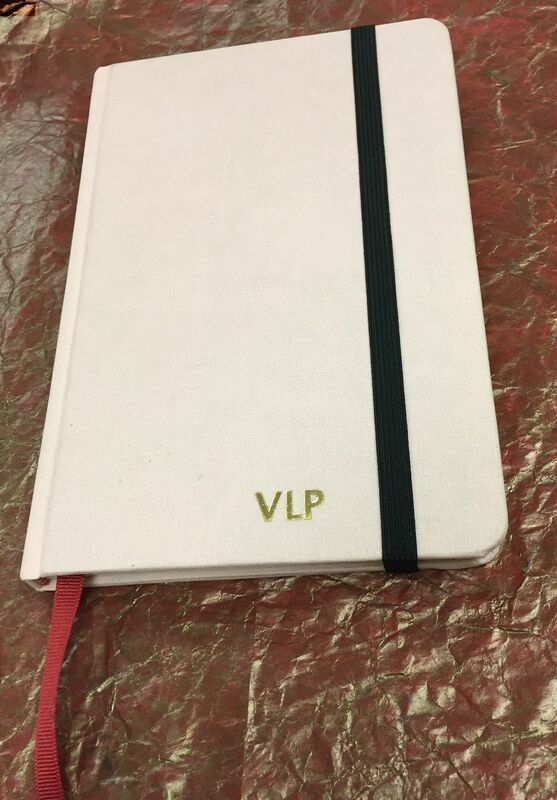 When you buy a journal from us online, you can select your own monogram lettering included in the cost! That’s not something you can get at Walmart, eh? We also love to experiment with non traditional cover materials as well. Look this summer for more tie die and denim journal covers! You won’t find anything like them anywhere else! Our aim is making American Made, high quality blank journals at decent prices. We make the books ourselves. We don’t outsource the labor to some factory (foreign or domestic) over which we have no control of. Many publishers of blank journals who outsource production overseas will often receive goods that cannot confirm origin of or consistency of materials used, including paper. These type of items are often churned out in mass quantities in factories paying their laborers far less per hour than the USA minimum wage. We can proudly say that our notebooks and journals are Made in the USA. Spending your money here is supporting American made, and local economies. Money we make in turn gets re-invested back in to our economy. We are fully aware the realities of the global economy. But we also strongly feel that if we all set our minds to it, we (hardworking citizens of the USA) could win back a lot of “lost jobs” and put more people back to work over here. We’re tackling this ourselves here at Design Bindery LLC. While this concept may not work so well as we inevitably need to “scale” our business, that’s just fine by us too. We may not grow too big, so fast, we promise to stay true to our ways along the journey. We take a portion of our profits, time and talent to supporting projects for clean water and education in some of the world’s poorest countries. As we grow, so will our giving. I once spoke to an artist who told me it was very difficult to let go of her paintings and sell them to someone else, because she became so connected to the piece. While we realize our journals may not be high brow pieces of art, we do feel very connected along the way to each and every one we make. We create each one of these notebooks with our own hands. These are not mass produced. We know that each journal we send out is going to a specific person. I guess what I wanted to say is that I hope the recipient of one of our journals understands that we enjoyed making it as much as they enjoyed using it! We really do value this opportunity we have to provide you with the vehicle, that canvas on which to write down your innermost thoughts.